Cohesion is what helps your reader understand the connection between your ideas. Transitions and conjunctions are the words and phrases that build cohesion. Here is a list of cohesion-building words. 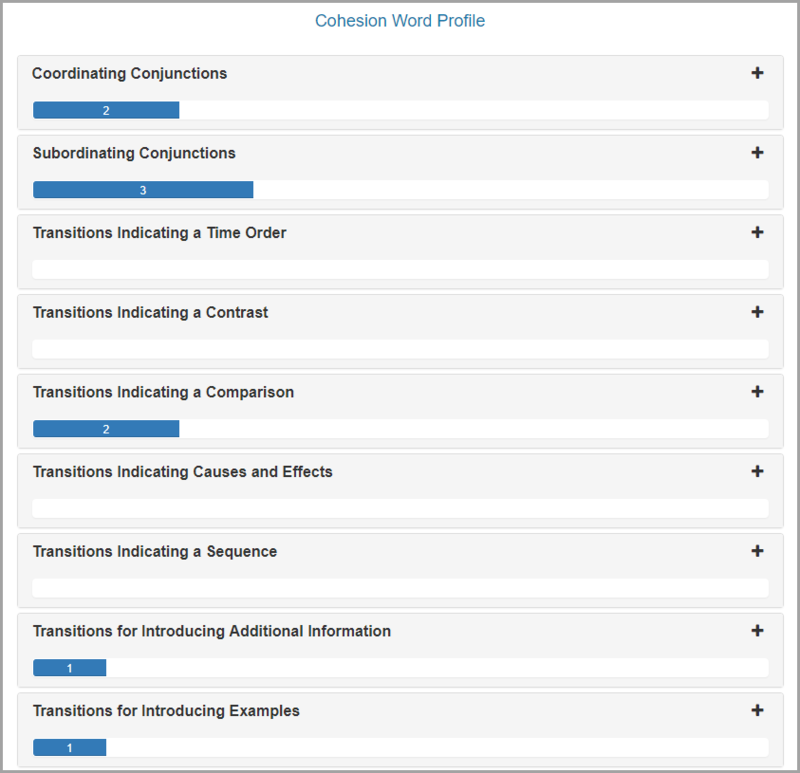 I have designed the Virtual Writing Tutor’s Cohesion Checker to measure the cohesion in your text by looking for transitions and conjunctions. When the system detects cohesion in your text, it displays a bar graph showing you what categories of transition words and conjunctions you have used. If you don’t use cohesion words in your text, you have a problem. Your writing will seem choppy and disconnected to your reader. On the other extreme, it is also possible to use too many cohesion words, which your reader will find awkward and distracting. If you are concerned about your ability to select and use transition words and conjunctions to build cohesion in your text, perhaps you should take a course. I have found two courses on Udemy by the same instructor that you might find useful. The first course is taught is highly rated and is specifically designed to help writers with want to learn more about creating cohesive texts. 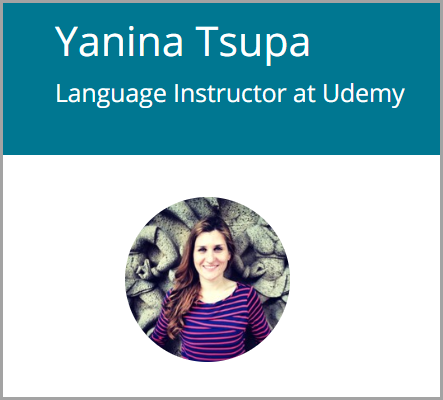 The teacher is called Yanina, and she is from Belarus. She has a Master’s degree in Teaching English and a second master’s degree in Curriculum Design and Learning. In other words, she is highly qualified. Students will be able to identify 9 categories of discourse connectors and the peculiarities of their use. Students will be able to practice using discourse connectors in sentences and paragraphs. Students will be able to gain confidence in using a variety of discourse connectors and express a variety of meanings in writing. Students will be able to improve coherence of their writing. Another course by Yanina Tsupa that addresses the problem of creating cohesion in a text is her new course on coordinating conjunctions. It is also highly rated. Students will be able to identify single- and multi word coordinating conjunctions in English. Students will be able to practice connecting ideas using SINGLE-WORD coordinating conjunctions FOR, AND, NOR, BUT, OR, YET. Students will be able to practice connecting ideas using MULTI-WORD correlative conjunctions BOTH…AND, NEITHER…NOR, EITHER…OR, NOT ONLY…BUT ALSO. Students will be able to identify the correct meaning of single-word coordinators, such as ADDITION, CAUSE and EFFECT, CONDITION, TEMPORAL SUCCESSION, CONCESSION. Students will be able to identify the correct meaning of multi-word coordinators, such as ADDITION, ALTERNATIVES, CONTRAST, CONCESSION. Students will be able to perform reduction of sentence with coordination. Whatever you decide, keep writing and keep using the Virtual Writing Tutor.